Audi may not be the only automaker out there toying with self-driving automobile technology, but it is arguably the fastest of them. A few years back, it raced unleashed a driverless TTS on the Bonneville Salt Flats, then sent it up Pikes Peak and around Thunderhill. But now it's taking things a step further with the vehicle you see here. This RS7 Sportback has been fitted with steering, brakes, throttle and transmission hooked up to a computer system that combines GPS, high-frequency radio signals and 3D imaging camera to drive the vehicle autonomously not just in slow-paced, stop-and-go traffic, but around the track at the same pace a professional racing driver would push it: full throttle on the straights, full braking before the corner and 1.1-g of cornering force. 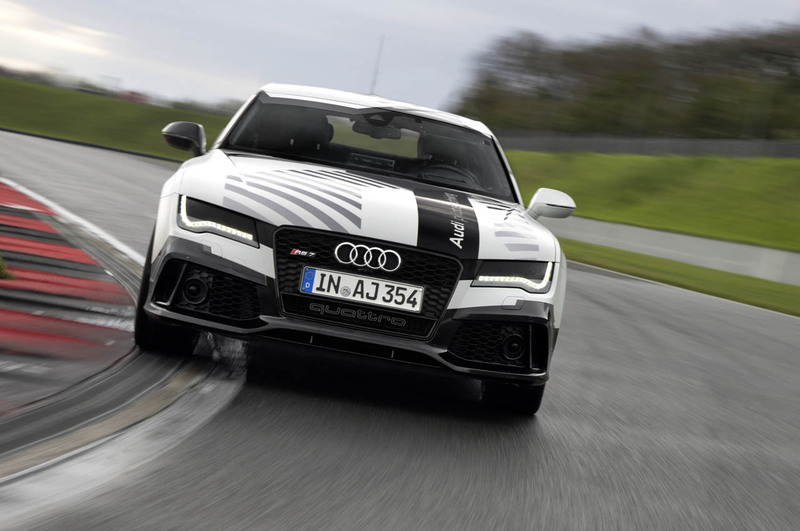 As promised, Audi plans to unleash the self-driving RS7 – which it calls "the sportiest piloted driving car in the world" – at Hockenheim next weekend prior to the DTM season finale, where it is anticipated to pull a 2:10 lap time. The next stage will be to set it lose on the Nürburgring Nordschleife, all 154 turns and 13 miles of it, which ought to pose a heck of a challenge to the engineers from Ingolstadt. In the meantime you can scope it out in the high-res image gallery above and the second teaser video above.